A 31-year-old man presents with a 6 cm right parapharyngeal soft tissue mass. The core biopsy demonstrates a mixed population of round and strap-shaped cells with bright eosinophilic cytoplasm. The nuclei are round to oval and hyperchromatic. Rare mitoses are seen. Cross striations are not appreciated. A collagenous matrix is present in the background. There is no necrosis. 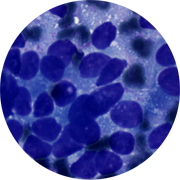 The smear preparations show numerous round and oval nuclei; rare strap-like cells are present. Intact cytoplasm is dense and non-vacuolated. Bits of myxoid stroma are present in the background. Immunoperoxidase stains are positive for vimentin, CD10, CD56, and EGFR and focally for SMA and desmin. The patient is diagnosed with rhabdomyosarcoma.